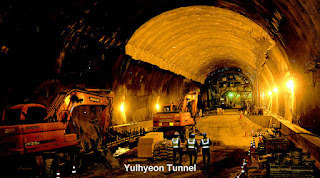 Last month, the Yulhyeon tunnel became the longest rail tunnel in South Korea, and the third longest in the world. • Gotthard Tunnel, 57 km (35.4 miles). • Seikan Tunnel, 54 km (33.5 miles) in Japan. 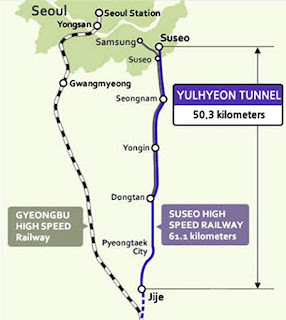 • The Yulhyeon Tunnel, 50.3 km (31.2 miles). 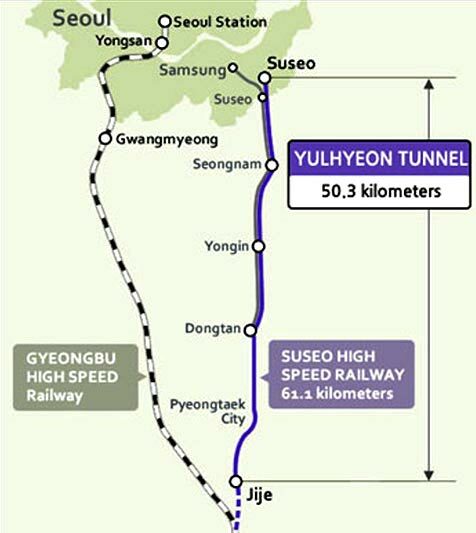 The Seoul metropolitan high-speed railway project broke ground in 2011 designed to build a 61.1 km-long (38 mile) high-speed railway connecting from Suseo in Seoul to Pyeongtaek in Gyeongi Province with a budget worth 3.06 trillion won (US$ 2.76 billion). The Yulhyeon Tunnel makes up 83 percent of the total railway project. 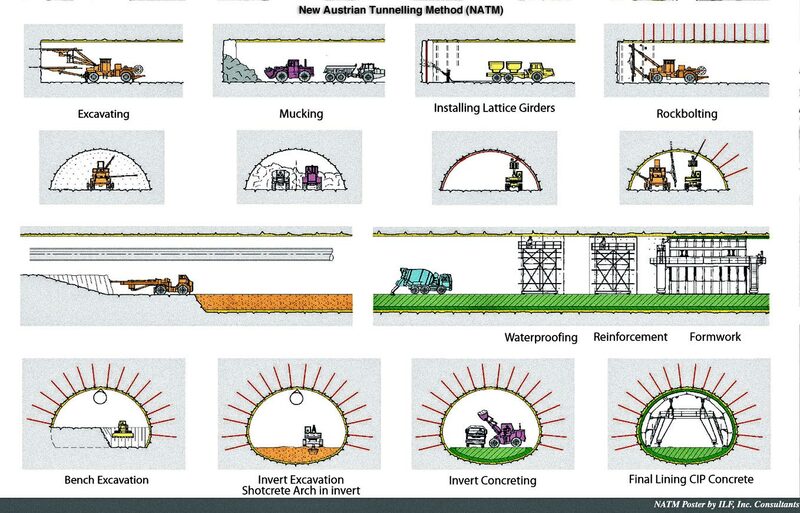 Excavation was completed in a total 21 headings advanced from access adits at every 2-3km (mile and a half) of the main tunnel length, each adit provided at least two tunnel headings. 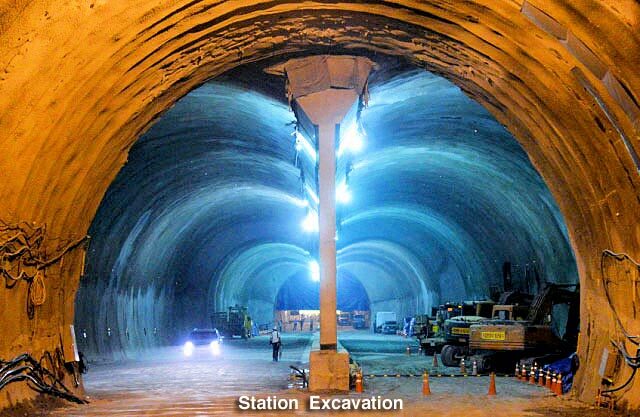 Ventilation shafts are located at about 3km intervals along the main tunnel alignment. The rail alignment runs mostly beneath a low mountainous area and there are no cities or urban areas above. 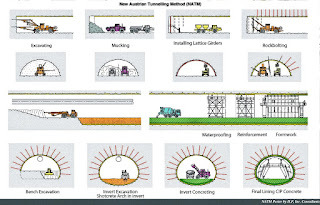 In zones of soft ground, a pilot tunnel with a center pillar and double arch NATM excavation to full cross section was utilized to control ground deformations. The total excavation period, including access adits and ventilation shafts, was a swift three years and five months from January 2012 to June 2015. Hyundai Rotem has been awarded two contracts to supply 300 km/h (186 mph) high speed train-sets. 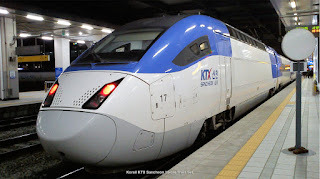 A 324bn won (US$282.6 B)contract covers 10 KTX-Sancheon train-sets for the Suseo High Speed Railway subsidiary of Korail, which will operate the 60 km high speed line [44:48] now under construction. Article aggregated from several South Korean resources. Protesters Give Shell a Warm Portland "Welcome!" "Shell! Shell! the Gang's All Here!"